Munera Sine Missione are a fast playing set of gladiator rules that can throw up a surprising amount of narrative. A major advantage is that they can be easily played solo. A famous exponent of this game, Mark Stevens, had moved overseas, and we had been thinking about how to play this by email. 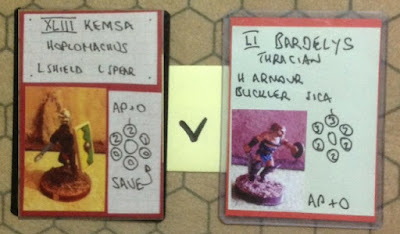 The thought was that the game could be run as a "solo" campaign with a GM; one player plays out the arena fights, whereas the GM controls the storyline between fights. The idea was that the "in-between" events were a set of multiple choices, and that it should not be too dangerous for the gladiator. However, the multiple choice way proved description heavy and in later campaigns, this grew into a skirmish game using the Song of Shadows and Dust rules instead. Initially, the campaign was a bit slow to start (and description heavy), as we were finding our way through how this works. It was played in just over about 2 weeks in April 2015; all communication was via email. 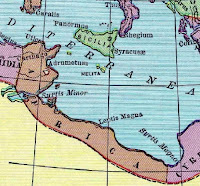 The campaign is set in Leptis Magna, in the province of Africa in the last years of Nero's reign. So it was that Mark used his figures (references to opponents etc are from Marks figure list) who also fought out the bouts, and I would do the GMing. From Mark's list of gladiators, he chose Mago, a Retiarius from the province of Africa. A second backup gladiator was also used, Kemsa (a hoplomachus, also from the province of Africa). Below are the emails that passed back and forth - my entries are in blue, Marks are in green. Any post edit comments are in red. I will post the whole campaign, round by round, on a weekly basis. For the Lanista to make a reasonable return on a gladiator, the gladiator needs to repay an amount of 100 gold aureus to the Lanista. This is repaid from a gladiators share of the winnings. Extra money can be earned in side activities. Depending on how the story goes, the Lanista might also sell the gladiator to another Familia. Or the gladiator could win the rudis and be freed! Mago is owned the Lanista Servius Albius Macer, who is based in the free city of Leptis Magna in Africa. A gruff man who squandered his family fortune at Capua (mostly from befriending the wrong people), he is trying to rebuild the glory of his house in the outer provinces. Nero is Emperor in Rome. 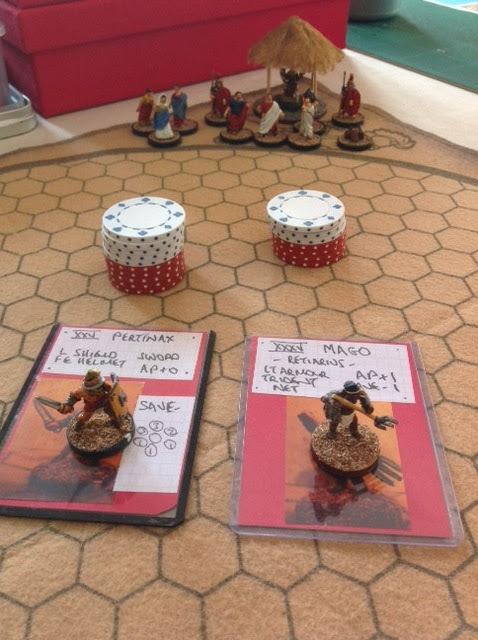 Even though Mago is untried, Macer is keen to start seeing some return from his investment and has enrolled Mago into the upcoming games, held in celebration of the great Roman victory over Carthage in the battle of Zama. Mago has been deemed to be on the “Carthaginian” side. His opponent, the cunning Pertinax (a Secutor), is on the “Roman” side. Though the crowd is quite partial the native “Carthaginian” side, publicly they will pretend to cheer for the “Roman” side. It is even rumoured that the current governor of Africa, Titus Flavius Vespasianus, may be in attendance. Macer, believing himself to be a good judge of character, is convinced nothing important will ever come of Vespasianus, but nevertheless, he is keen to impress anyone of station. Macer emphasises to Mago how important a win is here. Let me know the outcome of the fight with Pertinax (also with no skills), including how much strength & fatigue each one finished on. Well the first two games have been played. 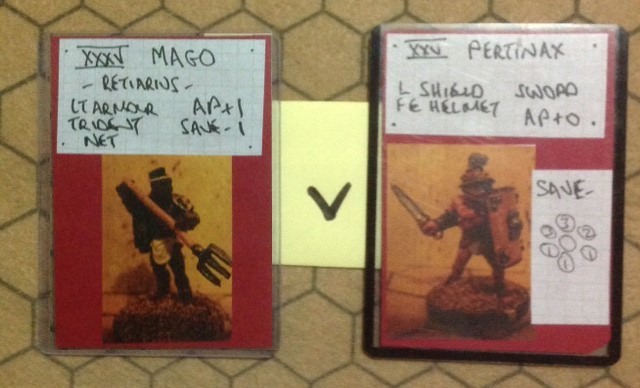 Photo of the Mago v Pertinax setup below, with the Governor and some of his cronies coming down to take a look. I think the fat guy with the walking stick on Vespasian's right (camera left) might be Macer. Or maybe not, he is probably not important enough to get that close to the Gov. Also as you will see I have also run Mago's best friend Kemsa. I suspect they were captured in the same slave raid when they were small boys over ten years ago, they certainly have some shared secret only they know. Mago - lost 4/7 strength, 2 fatigue - Vincit (Won). Bardelys adopted the tactic of bustling Kemsa so it was hard for him to use his long spear. However Kemsa's last attack, with the long spear disadvantaged at close range, was a "defender floored" special event. On paper the Thracian is the better figure, especially with armour saves, so a somewhat surprising trend prior to the special event. Back to you for the next steps!